Awesome ocean views and steps to the beach!!! Spend your holiday / family get together in a gorgeous 4500 sq. ft. home that can sleep 18 up to 20 persons (with set-up of additional blow-up beds). This house features 6 bedrooms plus 6 adjoining bathrooms and awesome amenities. This is a 2007 Nantucket-style home with spacious open-designed living room, dining and kitchen areas, perfect for those cozy family dinner gatherings. Easily whip up an impressive meal in the gourmet kitchen which includes a center island and complete stainless steel appliances (wine fridge, microwave, dishwasher, refrigerator w/ ice & water, double oven, 36' gourmet stove top and range hood, etc). Experience entertainment at its best with the state-of-the-art home theater system and built-in sound system installed throughout the house. Feel at home in the master bedroom with vaulted ceilings, custom-built walk-in closet and private deck with wet bar and fridge. Comfortably sleeps up to 18 but can add one (1) queen blow-up bed to sleep 2 more. Situated conveniently near Riviera Village with only steps away from groceries, banks, restaurants, outdoor cafes and shopping. Take a stroll to the beach and jogging paths. Other activities include surfing, fishing & whale watching in Redondo Pier. Enjoy a short drive (10-45 mins.) to popular sites like Universal Studios, Disneyland, Knott's Berry Farm, Hollywood Blvd., Farmer's Market, Angel's Stadium, Staples Center, Sta. Monica Pier, Manhattan Beach and Venice Beach among others. Only 20 minutes from LAX International Airport. My name is JD. Please feel free to contact my reservations manager, for your vacation stay request. This rare gem is located in a safe and peaceful neighborhood. It is also conveniently located just a stone's throw away from commercial Riviera Village where you can find groceries, banks, post office, unique shops, gym and spas. There are also several coffee shops and well-known restaurants in the area such as H.T. Grill and Mexican Riviera, which was voted as the best mexican restaurant in the south bay. We are also steps away from the beach where you can enjoy surfing, swimming or just simply laying out in the sun. 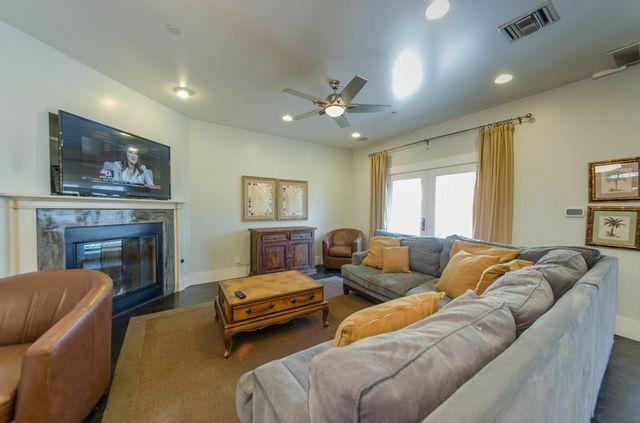 This property is easily accessible to and from LAX airport via the Metro Bus Line along Pacific Coast Highway. This same public transit will take our guests to the malls and other known attractions like downtown L.A., Hollywood, Theme Parks, Museums, Long Beach, etc. one-time set-up of towels & toiletries i.e. shampoo, conditioner, body wash & lotion are included in the rental. 2-car attached garage; driveway towards garage is a downward slope and may be too steep for small vehicles. Property was excellent. Location in Redondo can't be beat - a couple of blocks from the beach, shopping and restaurants, yet still quiet. Spacious, with en suite bathrooms in nearly every bedroom, comfortable beds, large dining room and living room. Lots of amenities, including a hot tub, gas grill, huge modern TVs in nearly every bedroom, and house wide wifi. Kitchen was also a highlight, our family was able to cook Christmas dinner using all of the utensils and pots and pans in the kitchen. Our only concern was a mixup with the entry code getting into the house on the first day. But otherwise this property was excellent. We thank you for the wonderful review and for your understanding despite the code mix-up. Thank you for choosing our home for your holiday vacation and we hope you consider our home again on your next visit to LA/South Bay. We had our team offsite at the house and it went well. It was nice to be able to walk a few blocks to the beach and plenty of restaurants. Thanks for the chocolates. We are happy that your team enjoyed their stay at the house. We thank you for your wonderful review. You are welcome to come stay at our house again on your next visit to LA/South Bay. We had a family reunion to celebrate my grandmother's 80th. This was the perfect place, with plenty of room for 17 people to comfortably all have space and privacy while still being an intimate family gathering. Each bedroom has its own bathroom which really made everything go smoothly. Even my grandmother could easily walk to beach in a few minutes. The hot tub was a huge hit, particularly after the beach. Everyone was so thrilled with this location that they were already talking about planning another trip. Thank you for your wonderful review. We're happy your grandmother's 80th birthday celebration was successful. Hope you consider our home again on your next event. Great place for a large group that is so close to the beach, restaurants, and shops! We had a family reunion and memorial for my father. 12 family members were very comfortable in this home. You can’t beat how close it was to the beach, restaurants, and shops. Each bedroom having a bathroom was great! We never had to worry about who needs the bathroom. I highly recommend this beautiful home! Thanks, the location was great, and the set up of additional beds in some of the rooms were perfect for the families with young children. Thank you for the wonderful review. We're happy you enjoyed your stay. We hope you consider our home again on your next visit to L.A. Thank you so much for letting us stay at your house. Our recent trip was fantastic! The home is just as it appears in pictures, even better. We had a group of 10 girls and there was more than enough room, and plenty of bathrooms! The living room and kitchen space was large enough that everyone could comfortable be in the same space without feeling crowded. The house was clean and the beds were comfortable. When we first arrived, there was some minor issues with plumbing drainage in a toilet and shower, and the heater in the Jacuzzi was not working, but the handyman Joe (I think that was his name) was FANTASTIC and came right over to fix the issues immediately. The house was walking distance to grocery stores like Vons and Trader Joes as well as a many of restaurants and bars. It was a short Uber ride or bike ride to the piers of Redondo and Hermosa beach. We even had tandem bikes delivered to the house and rode along the beach to Hermosa. Tip to future renters- once the jacuzzi was fixed, it does take about 3 hours to warm up, so just make sure you plan your day accordingly! Like the other reviewers, I would have loved it we could use the Jacuzzi after 9pm, but we knew the rules in advance and did follow them. Regardless we had a fantastic time! Thank you Elizabeth for your wonderful review. We're so happy that you enjoyed your stay. We hope you consider our home again on your next visit to L.A.
Our Beach Mini-Mansion is located right beside Riviera Village–a charming collection of over 300 eclectic shops, restaurants and services, just 20 miles south of Los Angeles. The gem of Redondo Beach, it is the South Bay destination for exceptional fashion, food, and gifts; whether an amazing outfit, a new hairstyle, pampering spa treatment, or delectable dining. streets or people-watch at one of the sidewalk cafes. Relax in a magical open environment where Redondo Beach sea breezes carry your cares away.